Direct revenue losses of Ukrainian budget at year-end can be UAH 16 billion (according to the Ministry of Finance of Ukraine). Due to the mass closure of businesses in Donetsk and Luhansk regions, budget losses on tax payments amounted to more than UAH 4,4 billion. According to forecast, the drop of Ukrainian GDP at year-end can constitute 7 to 9%, inflation will constitute 17 to 22%. 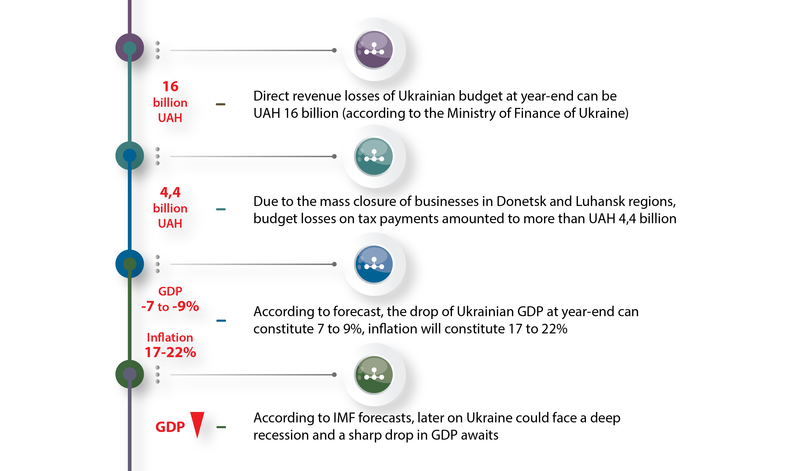 According to IMF forecasts, later on Ukraine could face a deep recession and a sharp drop in GDP awaits.